For many, OCD is an all-consuming, debilitating psychological condition that feels both overwhelming and difficult to change. Thankfully, OCD is a highly biological condition that, with the right combination of behavioral and medication treatment (when warranted and desired), is highly treatable! A New Beginning’s clinical team has several clinicians who specialize in the behavioral treatment of OCD. Obsessive Compulsive Disorder (OCD) is a disorder that affects individuals of all ages and walks of life, and occurs when an individual gets caught in a cycle of obsessions and compulsions. This cycle of obsessions and compulsions can become so extreme that it consumes much of the individual’s time and gets in the way of important activities that the person values. Although obsessions are varied, it is important to know that you are not alone! OCD affects 1 in 100 adults and 1 in 200 kids and teens with over 4.5 million individuals affected currently. While it may be helpful to realize that you are not alone, we know that living life filled with OCD is not a quality of life that anyone desires. OCD affects not only the individual; being a family member of a person with OCD is also full of challenges. As a loved one, it can be hard to watch someone you love live at the mercy of their OCD. But, thankfully, there are things you can do to help! At A New Beginning, we absolutely love working with partners, parents, and families to help them learn strategies for addressing the OCD. At A New Beginning, our team of skilled clinicians specializing in the treatment of OCD readily understand the causes and impact of OCD and we are here to guide you down a comforting path out. Cognitive Behavioral Therapy (CBT): CBT for OCD focuses on teaching techniques to help patients to explore, understand, and implement alternative ways of thinking and behaving. Acceptance and Commitment Therapy (ACT): ACT focuses on finding a way to allow obsessions and anxiety to come and go without interfering with the way one lives his or her life. Exposure Response Prevention Therapy (ERP): ERP therapy involves working with a licensed mental health provider to face your fears through “exposure” without doing your compulsions the “response prevention”. ERP is typically done in an outpatient setting, which means you visit your therapist’s office at a scheduled time weekly or a few times a week. In collaboration with your therapist, you will use structured exercises and tasks, as well as homework assignments to help you along the way. While seemingly daunting and perhaps a bit overwhelming, OCD is a very treatable condition. 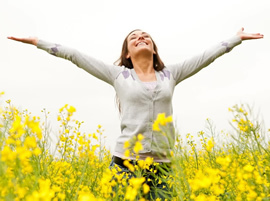 Our skilled clinicians at A New Beginning can help you or your loved one find peace from the constant mental chatter. There is a beautiful life out there…we’d like to help you find it!